www.gale.cengage.com/mygovernment Price: Pricing for individual school libraries starts at $795 for a one-year subscription, with district pricing available by quote. 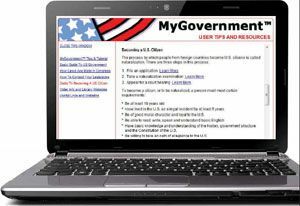 MyGovernment is an online tool that not only explains the hierarchy and workings of federal, state, and local governments, but allows anyone to locate, research, and contact all elected officials. Quality and Effectiveness: This is a fine tool for student citizens who want to make their voice be heard. Using the WHO tab, the user can search by name, or browse legislative chambers, state and federal government, or counties and their municipalities. From the WHAT tab, one can search for committee members, or target the departments that deal with certain issues. From the WHERE tab, a citizen can locate all elected officials who represent him, from the White House to local municipality, simply by entering a full street address or expanded zip code. But, MyGovernment is more than an index; it also provides biographies of many of the officials included, lists their committee and subcommittee memberships, and gives a voting history. Ease of Use: With a convenient tabbed interface and pop-up windows, searching MyGovernment and exploring its links is easy and straightforward. A handy Tips and Tutorial tab is available for first-time users. A few references are outdated, but this is to be expected with the scope of the content. Suitability for Use in a School Environment: This reference tool would be useful in a U.S. History, Life Skills, or Participation in Government course. • MyGovernment provides all of the basic information that every citizen should know about how his government functions, who represents him, and where he can turn for information or assistance in one convenient and easy to use site. • With a tool like this, students can easily learn to become knowledgeable, proactive citizens. • With easy to use indexes and handy tips along the way, anyone can locate, research and contact the proper elected official and understand what the candidates stand for when voters head to the polls.